aka "La Regina dei Nodi", aka "Königin der Knoten"
A Californian with Scottish roots, Pat Fish is 55 years old and has been tattooing since 1984. She is known as the "Queen of Knots," because she specializes in Celtic tattoos. 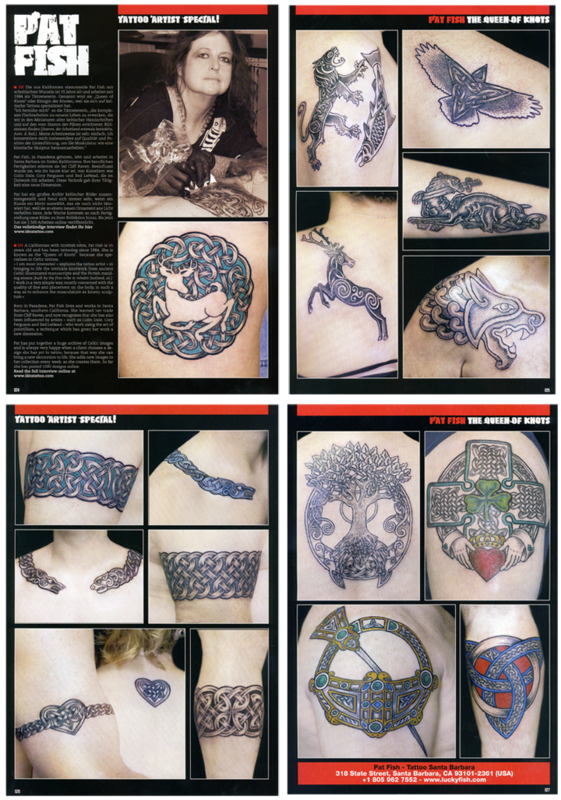 "I am most interested," explains the tattoo artist, "in bringing to life the intricate knotwork from ancient Celtic illuminated manuscripts and the Pictish standing stones (built by the first tribe to inhabit Scotland, ed.) I work in a very simple way, mostly concerned with the quality of line and placement on the body, in such a way as to enhance the musculature as kinetic sculpture." Born in Pasadena, Pat Fish lives and works in Santa Barbara, southern California. She learned her trade from Cliff Raven, and now recognizes that she has also been influenced by artists - such as Colin Dale, Cory Ferguson, and Xed LeHead - who work using the art of pointillism, a technique which has given her work a new dimension. Pat has put together a huge archive of Celtic images and is always very happy when a client chooses a design she has yet to tattoo, because that way she can bring a new decoration to life. She adds new images to her collection every week, as she creates them. So far she has posted 1500 designs online. Read the full review (in Italian !) online, and view an extensive photo portfolio.